Images from President and first lady's state dinner, held in the East Room of the White House and inside a tent on the South Lawn. Herrera Cabernet Sauvignon 2006 "Seleccion Rebecca"
Trenton, N.J., Lenox, Inc. Gift of the White House Historical Association, 2000. Commissioned to commemorate the 200th anniversary of the White House. New Castle, Penn., Castleton China, Inc. U.S. Government purchase, 1955. For the dinner, which took place in the East Room of the White House, guests sat at a combination of rectangular and round tables set for 10, while the two presidents and first ladies sat at a head table of 20. Tables were covered in boldly striped linens made in three hues of Mayan blue. The centerpieces were arranged in handmade woven baskets that had been gilded. Bouquets of fuchsia flowers, including seasonal Yve Piaget garden roses, amnesia roses and Cattleya orchids, were mixed with scented geranium foliage and prickly pear cactus. The performances took place inside a tent on the South Lawn of the White House. The tables were decorated in natural shades of oranges and greens. The focal point of each table was a bouquet of marzipan and chocolate flowers. The flowers are made into roses, the national flower of America, and dahlias, the national flower of Mexico. 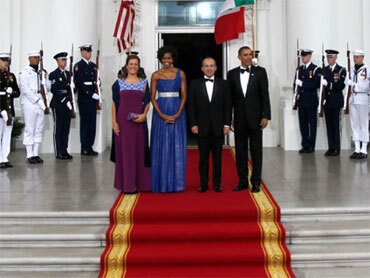 The guests of honor are Mexico's President Felipe Calderon and his wife, Margarita Zavala. Other political guests scheduled to attend included Vice President Joe Biden, Secretary of State Hillary Clinton and House Speaker Nancy Pelosi. From the entertainment world, guests expected to attend included Eva Longoria Parker, Mark Sanchez, Whoopi Goldberg, George Lopez and Gayle King. Beyonce, Mexican singing duo Rodrigo y Gabriela and the United States Marine Band are performed inside the tent on the South Lawn of the White House. Images from President and first lady's first state dinner, honoring the Prime Minister of India, held in a tent on the South Lawn of the White House.